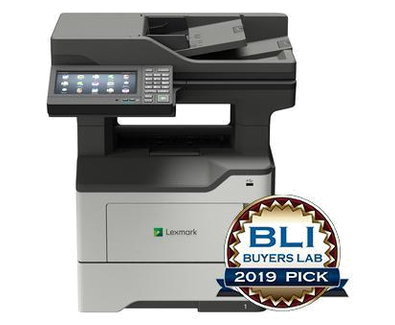 The Lexmark MB2650adwe offers printing at up to 50 pages per minute*, enhanced security, standard Wi-Fi and thoughtfully engineered durability. When performance meets simplicity, you get more done. The intuitive 7-inch tablet-like colour touch screen makes your tasks easy, and it’s the gateway to built-in productivity apps that save time and improve efficiency. With up to 50-page-per-minute* printing and a skilled scanner that can accurately capture up to 100 images per minute*, even with mixed originals, you’ll get what you need in a flash. It can even staple for you with its optional integrated stapler. Robust and reliable, Lexmark multifunction products are built to work anywhere from showroom to warehouse with few interventions. Keep going with long-life components, replacement cartridge yields up to 15,000 pages** and a maximum input capacity of 2300 pages.